Our domestic and commercial cleaning service is available in Livingston, West Lothian and surrounding areas. The services we offer include one-off deep cleans to regular contract cleaning on a weekly, fortnightly and monthly basis. We also specialise in Spring Cleans, Builders Cleans, Student House Cleaning and End of Tenancy Cleans. Please invite us to quote for your cleaning requirements. 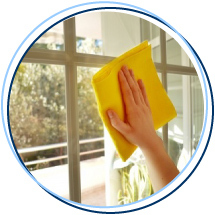 We will outline a cleaning routine based on the customer requirements. This can be as a regular general clean or a more extensive deep clean. or ironing requirements as you can. Life Maid Easy cleaning services covers the whole of West Lothian. This includes areas suchas Livingston, Bathgate, Whitburn, Blackburn, Armadale, Linlithgow, Broxburn, Uphall, West Calder, Mid Calder, East Calder and surrounding areas. EH27, EH28, EH29, EH30, EH48, EH51, EH52, EH53 and EH54. 07770 437596 or fill out our contact enquiry form.